A few days ago I shared my secret old fashioned cornbread dressing recipe with you. It is amazing! We usually make two pans to feed the family, and we always have leftovers. I swear leftovers are the best part of a holiday meal. Often times, we eat up all the turkey leftovers faster than the dressing. This is where my famous Turkey & Dressing Enchiladas come into play. 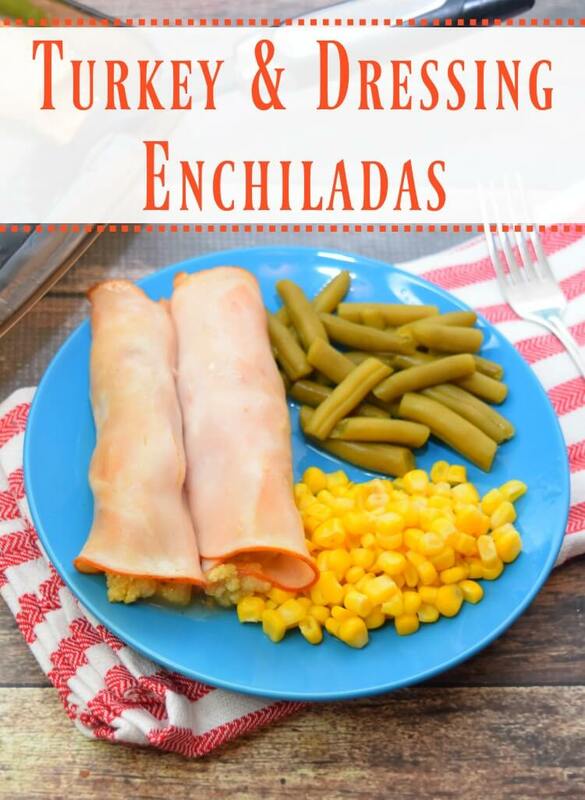 I got the idea to make Turkey & Dressing Enchiladas because Sam’s Club used to have this big casserole dish-sized meal you could buy with slices of turkey breast wrapped around dressing. As a kid, I loved that meal so much, I’d request it for my birthday dinner. Sadly, I haven’t been able to find it at Sam’s or Costco in years, so I started making my own using thick slices of turkey lunch meat. My family just loves it. In fact, we love this recipe so much, I sometimes just make a small pan of dressing and purchase sliced turkey just to make this for a Sunday dinner. 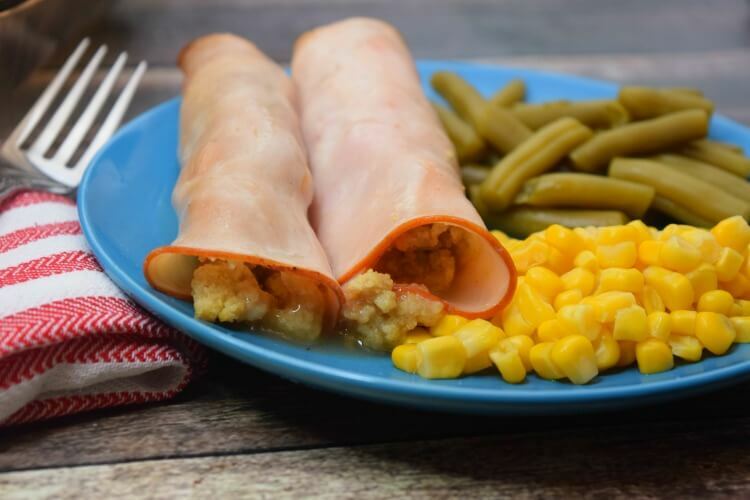 If you want turkey and dressing for your holiday meal, but don’t want to go to all that work of roasting a turkey, this is a great alternative! 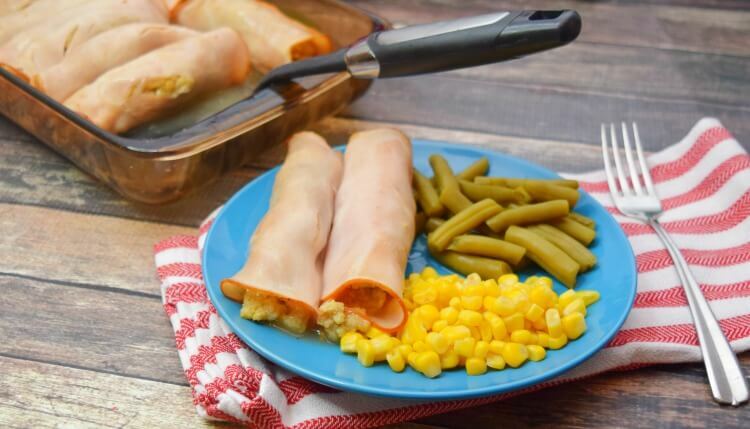 These Turkey and Dressing Enchiladas are perfect to use up the last of the dressing or stuffing from your holiday meal. 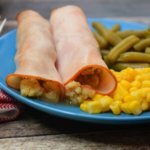 The family will love them, and they are so easy to make! Combine the dressing and the chicken broth and mix until it’s smooth and spreadable. In the center of a slice of turkey breast spread about 2 tablespoons of dressing. Roll up the turkey and place in a 9 x 13 pan. Continue filling and rolling the turkey slices until the pan is full. Pour the jar of gravy over the enchiladas. What’s your favorite recipe for Thanksgiving leftovers?